I'm giddy about being able to set up everything from scratch, ergonomically, and with Martha-level organization, in a room WITH A SKYLIGHT. Oh, the sewing gods, they have heard my prayers and rewarded my burnt (well, ripped) offerings. So here are the "before" pictures. Watch for the "after" pictures in, oh, about six weeks. (In my fantasies, the "after" pictures will look like a spread from Real Simple, right down to the matching boxes with letterpress labels). The "after" pictures will be taken in NATURAL LIGHT. Oh, I can't wait! What a great waving of the wands of good fortune–to have a real-live sewing room! I can’t wait to see it when you’ve got it all organized and set up exactly how you want it. DROOL.. Let me know when you wanna barter them sewing patterns, m’dear! Oh, what I’d give just to see them all close up! Congratulations! as one who has her own sewing room, I can promise that you will LOVE it! is that a singer slant-o-matic ? Wow, I see lots of fun stuff! We moved last year, so I know how much fun it is to set up a workspace from scratch. As I unpacked things into their new homes, it seemed like Christmas because I hadn’t seen some of the fabrics and other supplies in awhile. It also inspired me to get back to work and to use some of the things that I already have, rather than going out and buying more supplies! A skylight! That will be wonderful! I had a spasm of craft-related guilt when you mentioned the letterpressed labels, because not only is my sewing stuff not very organized, I have an old press (a present from my sweetie, who is also more DIY than she has time for) which I haven’t even broken in yet. I have type, too – a completely motley collection that she bought loose in a box at a flea market, and I sorted (lead poisoning, anyone?). So my dream is a BIG, all-craft, all the time room. Maybe someday.We went to San Francisco yesterday to see the Gee’s Bend Quilts exhibit. I highly recommend it to anyone who is remotely interested in textiles, or art. They look great in the book but in person they just glow; my quilter friend and I floated out on a wave of inspiration. Congratulations! There is nothing like having your own sewing space. Have fun organizing it! I agree with a number of the comments left here .I WOULD LOVE TO GET MY HANDS ON THOSE PATTERNS!I mean, I am enjoying looking at your work area, and appreciate the possibilities of your new work space…. 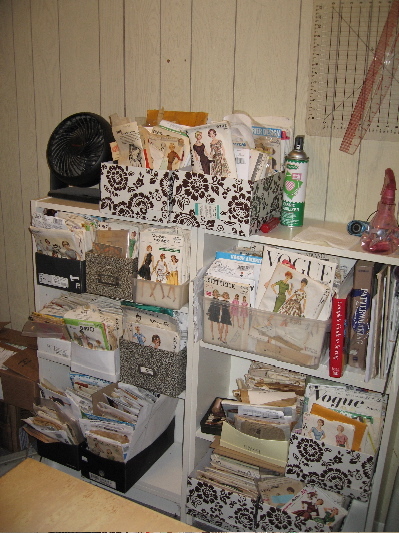 but it is like a dream I sometimes have….coming across a box of old patterns or old fabric…….mine, all mine!!!!!!! This looks just like my walk in closet. Im so not organized. I can’t wait to see it organized the way you want. I will have to send you a picture of my pattern cabinet when I get finished. It is out in the garage being sanded right now almost ready to be painted. I can hardly wait to put all my patterns in it. Patterns are scattered all over the house. Yeah!!!! I love having a “hat room”, where I also sew, and have my personal library behind glass doors. Bless Ikea! Plan your space and color scheme well, it is a constant delight once it all is pulled together. 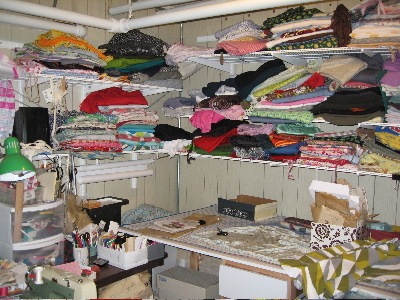 You can see my hat/sewing room at blogger bites for posting..beware of switching) I was so brave as to also post how my sewing/milinery space looks mid-creating explosion. You know, how it looks when you are short of time and long on inspirationg and high on demand for finished product for an occasion.FUN!!!! Make that: see my millinery/sewing space (check out IKEA shelves/cases) and see it mid-project melt down! ooooeeer (the sound a jealous crafter creates) I love the patterns I can see, and the black and white boxes they are in. Congratulations on the sewing room. Good luck to you, have fun organizing. In about 2 months I will have to move too. But I wasn’t this lucky, no separate sewing room.I hope to find a little niche somewhere outside the dinning area. My fabric lives in plasic boxes for years now. I am curious what new things will come out of all this nice fabric. I hope to see lots of nice new dresses ;-). One can never have too much dresses to look at. At least the ones to look at, don’t use closet space ;-). ooooh, i can’t wait either! i’m sure martha stewart would press and fold all the fabrics to the same dimensions!when my pattern collection was more organized, all my patterns of the same company were in boxes together. also, i had photocopied the back of each of the envelopes and put them in a small notebook, divided by style … pants, skirts, dresses, tops, combination patterns, etc ….those days of organization are long gone though.but, i wish you great luck in your reorganization. i find my creative juices and motivation flow better when i’m not surrounded by chaos. Oh Erin, those could be pics of my own sewing/craft “room”!!! I have a big walk in closet in my upstairs hallway that I use, and Im grateful, as you, to have graduated from the dining room table in our old house a few years ago!. Now both my girls have moved out this summer, one to downtown Chicago, and one to Charlotte NC, and the urge to take over a bedroom is OVERWHELMING….LOL..and I keep thinking..but that would be so rude!! The sewing demons are winning out! 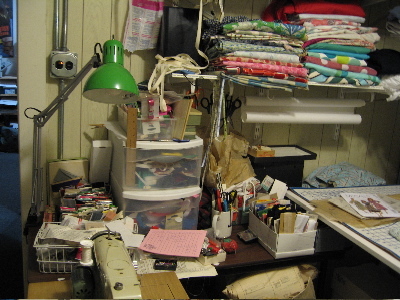 My old sewing space was in a windowless room in the basement and it felt like a closed in box. My new space is also in the basement but this one is a walk-out and my machines flank the west facing windows. Much better! For patterns, I bought 5 drawer filing cabinets at auction for 5 bucks each. If I were Martha I’d paint them or decoupage them but for now I’m just happy to have the drawers labeled. How did you get pictures of my office/photography studio/storage room? I’m not moving but was moved to clear my space this long weekend (DH is playing with our girls and that makes this project possible). Now I have neatly stacked bins and I can actually find my mannequins! Good luck in your move and congratulations on your new sewing room! I love reading Dress A Day! I love to look at peoples work spaces. I feel so normal when I see such a great bunch of organized “clutter”.I hope your new space will be all you want it to be! Congratulations on the new sewing room. I’ve been lucky to have my own space since we moved into our house 12 years ago. I decided to decorate it with my other passion–Elvis! It’s painted pink, gray tweed carpet, Elvis-print curtains, and Elvis memorabilia everywhere. I even use the Elvis Valentine’s Day Chocolate tins to store notions. DH put up shelves and thread racks on the walls. It just doesn’t get any better than this! 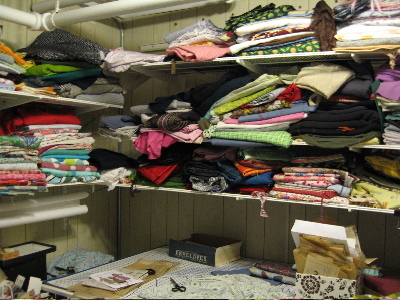 MY GOODNESS!I have been in desperate need to find ways to organize my sewing room. I wish I had taken before pictures. Your sewing room looks exactly like mine except I have two more longer shelves than you full of fabric, the room is 10×11 and lined up around all of the walls are nothing but bolts of fabric, the closet in the room is filled with two 30 gallon containers of fabric and stuffed on top of them are even more fabrics. Now, lets talk about the garage. There are ten 30 and 40 gallon containers out there with nothing but fabric. And there are also other bolts out there marinating in the smell of gasoline from my husbands tractor. I am in deperate need of some organizion. I get so elated when I think of sewing until I actually walk into my room and I can’t even get the door open bcause things are all over the floor. Then I am totally depressed. Does anyone know where I can find great cabinets to hide the folded fabrics that I have? I wonder if anyone in the world has as much fabric as I do in one house? I probably have well over 100 patterns. At least you have a shelf to place your on. Mine are just wherever they fall. My husband has a fit everytime I buy a piece of fabric. One day, while in Wal-Mart, he caught me buying some and said, “Dont get another piece of fabric!” The ladies cutting it said, “its only $1 per yard you just can’t beat that.” My husband looked at them and said, ‘MY WIFE HAS MORE FABRIC THAN WHATS IN THIS STORE.” GUESS WHAT? He was right. HELP!!! !